Here is a list of Best Free Bloatware Remover For Windows. These Software help you to remove Bloatware from your computer. Bloatware are also commonly known as Crapware. Bloatware are generally provided pre-installed on new computers by the manufacturers. These applications usually are overpacked with features, occupies a lot of disc space, and make your computer sluggish. Use these Bloatware Remover Software to remove Bloatware from your computer. Few of these ask for your permission before cleaning your computer, few just remove Bloatware automatically. Some of these Bloatware removers for Windows also provide you with rating of installed applications, and rank them according to uselessness. Some of the Bloatware can be very useful, and you might want to keep them, so few software let you uninstall the selected applications only. Should I Remove It? is my favorite Bloatware Removal Software. It is the simplest, and most effective Bloatware remover. On the basis of ratings, it shows the Removal percentage for a Bloatware. If the removal percentage is more for an application, it is an unwanted one, and must be uninstalled. You can decide whether to keep an application or not on the basis of Removal percentage. Just select the application, and hit remove to uninstall it. 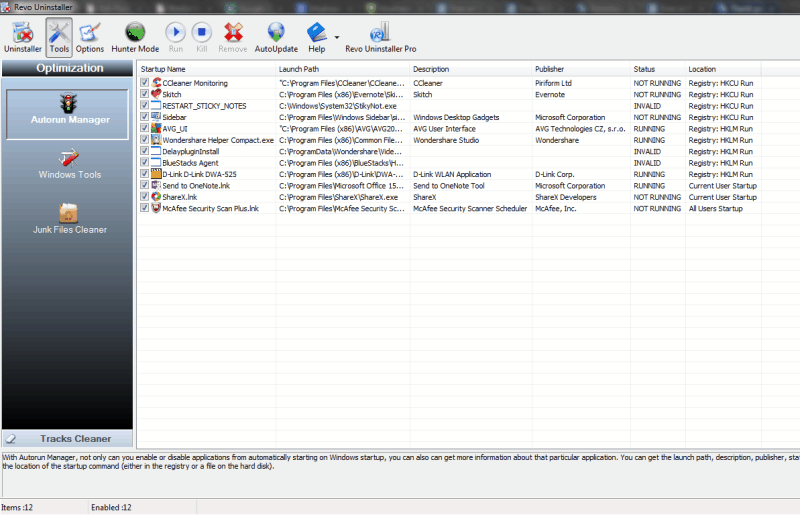 You can also take a look at the List of Rootkit Removers, Adware Removers, and Batch Uninstaller software for Windows. Should I Remove It? is a pretty simple and easy to use Bloatware remover. This software helps you decide whether to keep a software, or not. It lists out all kind of Bloatware, and Crapware from your computer, like Unwanted Bundled Software, Toolbars, Spyware, Adware, Malware, etc. 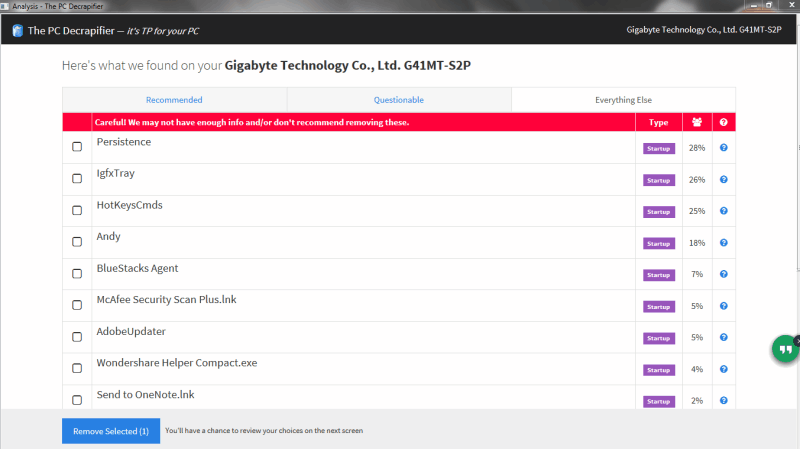 The list of software is scanned, and ranked by this Bloatware remover. The more the Removal percentage, the more an application can be harmful to your computer. It makes it easy for you to decide if you should keep an application. Along with the removal percentage, you can also view the rating of the installed software. Should I Remove It? occupies very little space, and does its job pretty efficiently. Although it has minimum features, it carries out the Bloatware removal without any issue. Automatic: Run this automatic mode to clean up and delete every third party software, or items on your computer. When you run it in this mode, Decrap does the cleaning without asking for any permission. It also cleans up the registry, and creates a System restore point. Scan all the software and registry on the system. Filter out the software, or registry that you want to keep. Create a system restore point (backup). 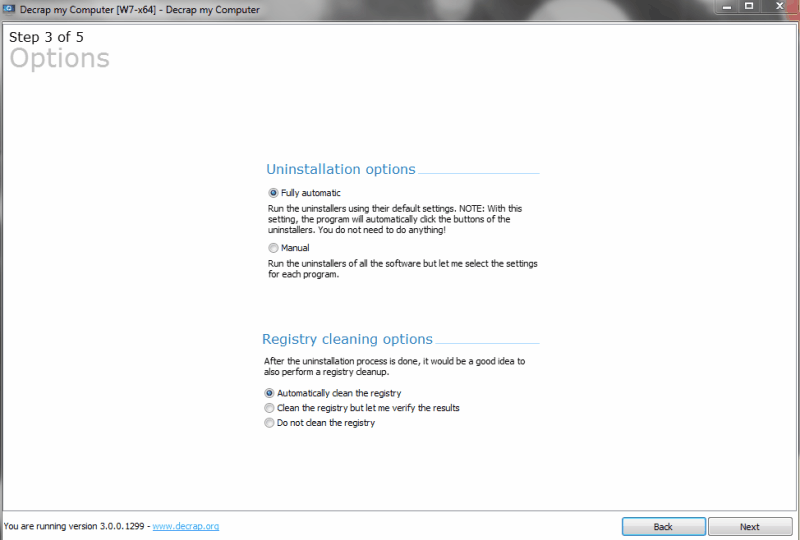 Set uninstallation and registry cleanup options. Remove Bloatware from your computer. After uninstalling the Bloatware, the Bloatware remover closes automatically. This Bloatware removal software for Windows is available in different languages, like: Arabic, Chinese, French, German, Japanese, Korean, Russian, etc. The software is really light, and is compatible with Windows 8, 7, Vista, and XP. Slim Computer is another free Bloatware remover for Windows computers. This Bloatware Remover is absolutely free to use. It helps you track and remove pre-loaded promotional software, toolbars, or trialware from your computer. It scans your computer for such software, and rates them based on user votes. Use the user's data to decide whether to keep a software or not. The generated list of Applications shows you the Community Rating, Publisher info, Uninstall path, and More info of the Applications. 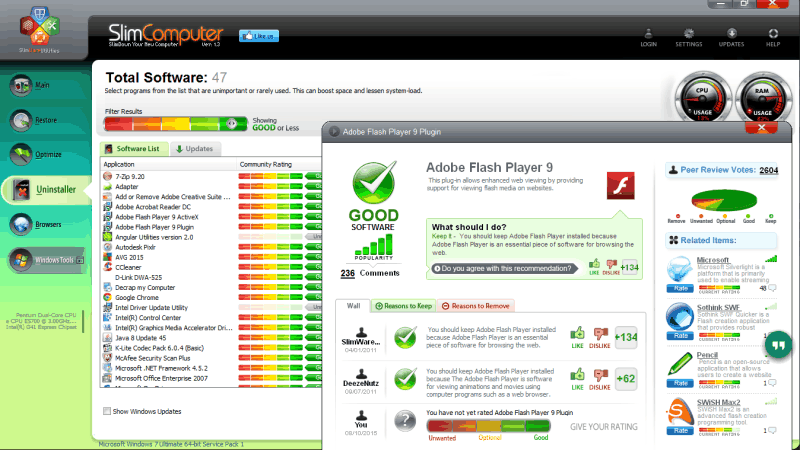 Click on the "More Info" to grab a detailed rating, review, and votes for a software. If an Application is potentially unwanted, it is highlighted as Unwanted, and you can Uninstall it right away by selecting it, and clicking the Uninstall button. Run scan on your computer to clear out unnecessary Applications, Browser data, Startup Items, Shortcuts, etc. Restore the important removed data, application, etc which were removed during the cleanup. Optimize applications to auto start at the time of system boot. Organize the available Internet Browsers, manage their plugins, remove history, restore, etc. Access difficult to reach Windows tools easily. Example: Device Manager, Registry Editor, Disc Derangement, Control Panel, System Restore, etc. Recommended: Based on users, it lists the potentially unwanted application. These include Bloatware, Malware, Crapware, etc. which were removed by maximum users. Questionable: The applications listed in this category maybe unwanted, but can be actually useful. The software recommends removing the software in this list with caution. Everything Else: This list includes every other installed software on the system. You can go through the list to filter out any application if you want to remove it. View the removal percentage to decide if you want to keep the software. The PC Decrapifier is a really simplistic software which is easy to operate, and quite handy with removing bloatware from your system. Crap Killer is an application, or you can say "A Command Line Script", which detects Bloatware automatically, and uninstalls them. It basically follows a Heuristic Detection Algorithm, which makes the script remove some useful programs along with Bloatware. This is a perfect program to run when you get a new system, and want to remove all the Bloatware, and Crapware before you begin working with it. Running this software leaves your system clean, and fresh. It also removes other unnecessary applications, like toolbars, coupon printers, etc. This is a very basic and awesome tool to clean up your system. But, as it may remove some programs you do not want to, it is recommended to be used with new computers only. Hunter Mode: You can switch to Hunter Mode, to selectively target a program. Drag and drop the hunter mode icon on the program's icon to perform the following operation on it: Uninstall, enable/disable auto startup, kill process, open containing folder, delete, etc. Junk File Cleaner: Finds all kind of unnecessary files, and junk files from your computer. These files use up free space, and may lead to a slower speed of computer. Once these files are scanned, you can remove them permanently from your system. Autorun Manager: Displays the list of software which start along with the system reboot. You can manage to enable, or disable these software at the time of startup. Windows Tools: This feature gives you direct access to some of the Windows tools. These tools are either hard to access, or use complex command lines. Tracks Cleaner: This a very useful feature, which lets you clean the track, or history of your work from the computer. This feature includes tools like: Browser cleaner, Microsoft Office Cleaner, Windows Cleaner, Evidence Remover, and Unrecoverable delete. The program, and its features are completely free to use. You can also upgrade to Revo Uninstaller Pro to use few more premium features.